They were put in one of five test groups and they remembered nothing. Not even why they were there. All around them were Walls. Anyone who climbed the Wall came back scorched completely. They had to survive in their area with nothing but what was given to them, with group A having advanced technology and group E having very little freshwater. Then at age eighteen, boys vanished mysteriously. This is called a Heisting. Those five test groups were the first part of the Laicos Project: to destroy AmWest. 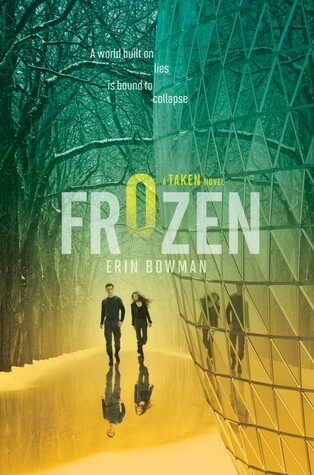 The book Frozen by Erin Bowman is a phenomenal book that is action packed and suspenseful. Bowman does not reintroduce the characters and the setting like a broken record as some other authors do at the beginning of sequels. Instead, she starts the book off with a small group of Rebels hiking to group A. The Rebels believe that the Franconian Order and their beliefs are insane and cruel. The leader of the Order, Frank, spends most of his time focusing on trying to eliminate his enemies instead of taking care of the people in Taem which is a poor choice. Erin Bowman’s Frozen intrigued me with its unique, adventurous and action packed story. Gray has some serious problems with his relationship status. You see, Emma has grown up with Gray, but when they were separated at Taem, Gray escapes to the Rebel’s base. There, Gray meets Bree. Throughout the entire book, Gray struggles to find which one is his true love. Also, on the cover, Gray is shown with a girl, but I could not guess if it was Bree or Emma and it is never mentioned in the book. However, there are many more good things about the book than bad things. The action and adventure in Frozen kept me wondering why I had not heard of this book sooner. Frozen had me on the edge of my seat wondering if Gray was going to come out of whatever mess he got himself into, alive. The setting in Frozen might be a little complicated if you have not read Taken, but it is introduced a little after the start of the book. Because of rising waters, people moved more inland to domed cities like Taem. America split into AmEast and AmWest, for many were fighting over resources. AmWest was very mad and sent a bioweapon to AmEast, which killed many people. Ever since, AmEast is trying to get revenge. If you do not like action packed books, I am sorry for informing you about this awesome book that will blow your mind away. If you do like dystopian, action, and adventure, or like books such as Maze Runner by James Dashner or the Legend series by Marie Lu, this book shall not disappoint you.